As a mother of two special needs children, especially one who is getting old enough to understand more and more, it’s getting harder to shield them from the tragedy that is around us. Between the media, and even conversations with others that they may overhear, it’s becoming increasingly inevitable that I will have to talk to my children about these topics. The Episcopal Center for Children (ECC), is a nonprofit school serving children with special needs ages 5-14 in the Washington, DC area. Below are their tips on how to talk to your child about tragedy. Talk with your child about the tragedy in a way that is appropriate for his or her age. Elementary schoolers may have questions about their own safety and security. Older children may want more information about the cause of the tragedy or how it could be prevented. 2. Share What’s Appropriate for Your Child. Be mindful about the personality of your child. Your child may be a 6-year-old who laughs at monsters in movies and can handle the truth about bad guys being a reality of life. Or your child may be a 10-year-old who cannot handle scary movies and gets emotional when people are hurt. When answering your child’s questions about tragic news events, let the unique personality of your child be your guide. When answering questions about tragic events, let your child’s unique personality be your guide. 3. Let Them Know It’s Okay to Talk to You About the Tragedy. Spend time talking with your special needs child. Let them know they are welcome to ask questions and express their concerns and feelings. You might not know all the answers and it’s okay to say that. At the same time, don’t push them to talk if they don’t want to. Let them know you are available when they’re ready. Your child will look to you for cues about how to react. It’s okay for children to see adults sad or crying, but consider excusing yourself if you are experiencing intense emotions. 5. Reassure Your Child About Their Safety. Point out things that ensure your child’s immediate safety and the safety of the community. Review your family’s plans for responding to a crisis. Assure your child they are safe and loved. Constant exposure to coverage of a tragedy can heighten anxiety. Don’t allow young children to repeatedly see or hear news coverage of a tragedy. Even if your child is engrossed in play, they are likely aware of what you are watching on television – and can become confused or upset. Older children might want to learn more about a tragedy by reading or watching TV. However, avoid repetitive loops of news information once you have the facts. 8. Maintain the Family Routines. Continue your family’s usual routines for waking up, dinner time, and bedtime. The familiarity of these routines will help your child. Encourage your child to drink enough water, eat regularly, rest, and exercise. Don’t forget to follow this advice for yourself too! 10. Spend Extra Time Together. Spend a little more time reading to your child. Take a few extra moments when tucking them in at night. If your child is having trouble sleeping, allow them to sleep with a light on or to sleep in your room for a short time. Extra hugs and cuddles are good too. All of these actions can improve your child’s sense of security. 11. Watch for Signs of Stress and Anxiety in Your Child. After a tragedy, help relieve stress/anxiety in your #specialneeds child. Assure them they’re safe. 13. Pay Close Attention to Your Child. If your child has emotional problems, learning challenges, has gone through major changes at home, or has experienced trauma in the past, pay close attention. Children can merge a new trauma and it can heighten their anxieties. 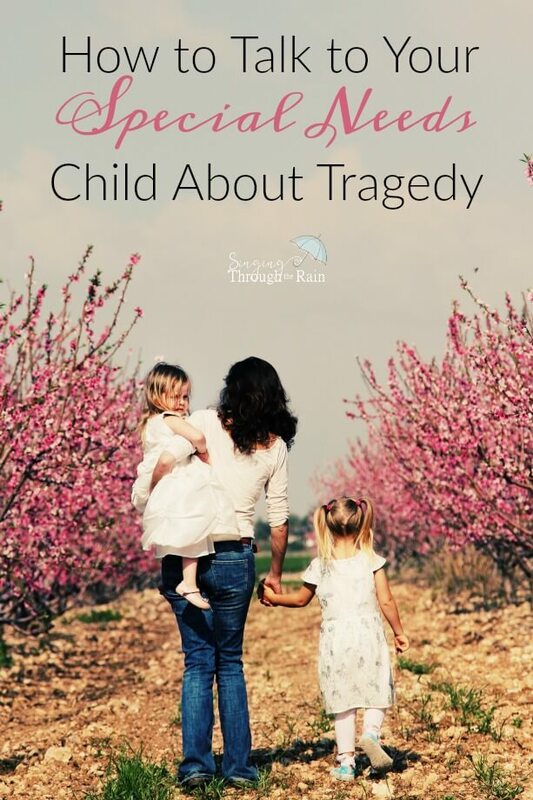 If your child has suffered a loss, is facing special challenges, or been exposed to other trauma, they may be at greater risk of a severe reaction to a new tragic event. Watch your child closely for any changes in mood or behavior. 14. Don’t Dismiss or Minimize Your Child’s Feelings. 15. Encourage the Expression of Feelings. Explain that it’s okay to be upset. Let your child write about or draw what he or she is feeling. Physical activity might serve as an outlet for feelings or frustration. If your child is acting out, explain that there are other ways of coping. 16. Do Something for Those Affected by the Tragedy. 17. Get Help if Needed. If your child is still exhibiting signs of anxiety after a week or two. 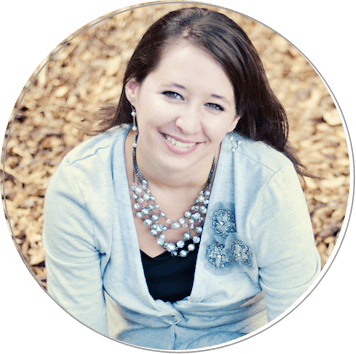 Seek out a school counselor, therapist, a pastor, or any other spiritual leader or mental health professional. What about YOU? How do you talk to your kids about tragedy?